While you spend two hours on our bike, most guests do not just zoom in to ride the bike and head back home as soon as it ends. They want a fun experience both before and after their ride. We understand that and it is why we’ve chosen to start and end our tours at Bookies Bar and Grille. And Bookies gets this too and is ready to welcome all of our riders to make sure you have a fun start and end to your time in Detroit on Detroit’s Party Bike. Last year, we witnessed work outings, bachlorette parties, birthday parties, family reunions and gatherings of friends start their experience by sharing a few laughs, drinks and maybe a bite to eat while they awaited their time to go on the bike. It really augments the experience for our guests. 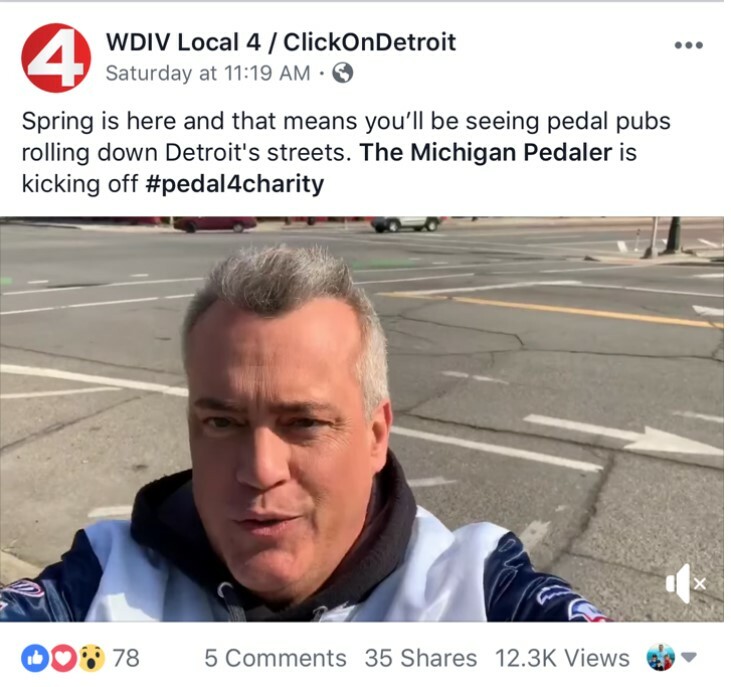 With good food, plenty of drink options and friendly service a given, here is why we believe The Michigan Pedaler provides our guests with an unrivaled experience due to our great relationship with the team at Bookies Bar & Grille to bookend your time on the bike. Lots of accessible parking – some FREE! An Exclusive offer for Michigan Pedaler riders to reserve the second floor VIP room for a private party for your group. Bookies is located just three blocks from Comerica Park. Easy to find and very accessible off numerous freeways, Bookies has been a popular hot spot for concerts, sporting events and other events in the city for years. You’ll find it easy reach if you are coming from out of state, out of town, or simply just around the block. 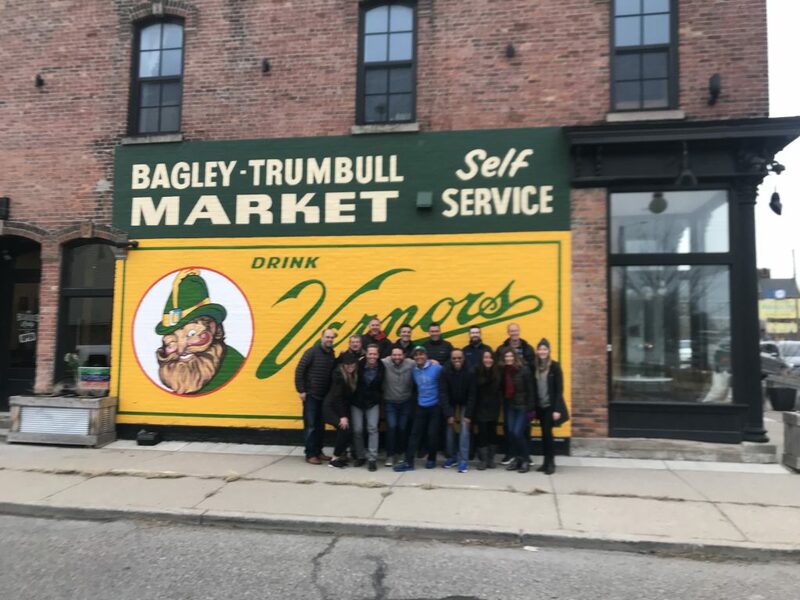 With its central location, it easily allows us to take your group on the tour of your choice – to Downtown, Corktown, or Midtown. Being in the Stadium District means there are lots of parking options nearby. Bookies is located at the corner of Cass and Columbia Street. The parking on Columbia Street is always free. There are metered spots you can park on Cass and other nearby streets. On Sunday, these spots are also free. If you need to pay for parking because there is an event in town, you have multiple lots to choose from (usually $5-$20) and if you are willing to walk a few blocks, you will find a cheaper rate ($3-$5). Finally, if there is not an event in which the lots are charging for parking, you are allowed to use the lot behind Bookies on Columbia Street for free. Of course, you can order anything on the menu or ask for anything at the bar. Bookies also offers the following special to Pedaler riders: A pitcher of domestic draft and four shots for $15! Bookies has three floors of fun. The ground floor is a large expansive sports bar with a long bar, pool table, Golden Tee, plenty of TVs and of course, tables for you to gather. 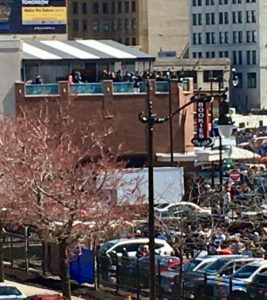 The third floor rooftop at Bookies is a bustling place that is perfect to enjoy a beautiful day in The D.
The third floor has a large rooftop deck that is perfect for those great summer days we love in The D. It also has an indoor bar. Bookies offers Michigan Pedaler riders the chance to reserve their second floor VIP room which is great for exclusive parties of 10-50 people. You can reserve it for up to 90 minutes before your scheduled departure. This is first-come, first-serve basis subject to availability. There is no charge for Michigan Pedaler guests to do so but a $100 deposit is taken when you reserve. This amount is then applied to your food and drink bill. Work groups coming in for a bike ride — this is a great option. 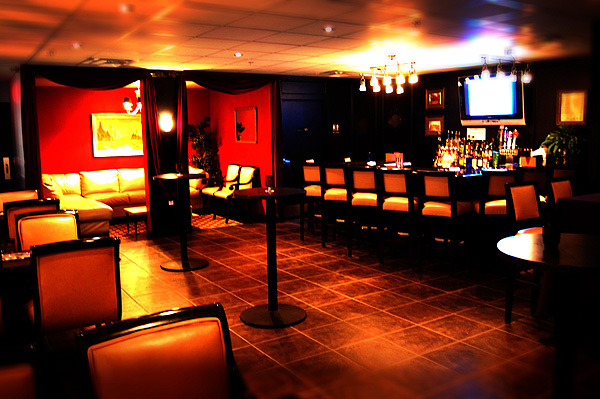 Looking to have a private room to kickoff your bachlorette party? This is your answer. The room comes with your own personal bartender. We’re pleased to bring so many options for our riders so they can have the best possible experience when they book a ride with The Michigan Pedaler.